Most European countries are now trying to reduce their deficits, which is basically good since most of them have had excessive levels of deficit spending. The problem is that most of them have to a too large extent tried to achieve that with growth harming tax increases, instead of spending cuts. The tax hike of choice has been the Value Added Tax (VAT) and/or excise taxes on various goods, usually diesel/gasoline, tobacco and/or alcohol. The idea behind this appears to be that because consumption taxes supposedly only targets consumption it won't affect the incentive to produce. That is wrong for several reasons. While I disagree with Murray Rothbard's extreme assertion that consumption taxes will only reduce prices excluding taxes and not affect prices including taxes, it is clearly the case that it will reduce prices excluding taxes, having the same effect on these producers as an income tax would have had. And furthermore, higher prices of consumer goods will reduce the real value of everyone's income, again having a similar effect as an income tax would have. It is true that the incentive effect of consumption taxes will be less than an income tax on labor income assuming it won't affect the level of unemployment benefits and other non-labor transfer payments (which are usually not subjected to income taxation), but while that assumption may be applicable in the short term, in the long term consumption taxes will likely create a political pressure to raise these benefits. Another difference between consumption taxes on the one hand and income/payroll taxes on the other hand is that while both taxes domestic production for domestic consumers equally, consumption taxes taxes imports but not exports while income/payroll taxes taxes exports but not imports, and so a shift from income/payroll taxes to consumption taxes could be seen as a "hidden" form of mercantilist import tariffs. But since there is no reason to believe that mercantilism promotes prosperity that is not an argument for consumption taxes. For people who view NGDP (Nominal GDP) as important, the latest U.S. GDP report should be seen as very bullish. The headline volume number was upwardly revised from 2.8% to 3%, but the terms of trade adjusted was upwardly adjusted even more, from 2.4% to 2.8% and as domestic price inflation was upwardly adjusted from 0.8% to 1.1%, NGDP was upwardly adjusted from 3.2% to 3.9%. Almost (yesterday's durable goods numbers were an anomaly) all data suggests that NGDP will increase even faster in the first quarter, reflecting both higher real growth and higher price inflation, driven by the rapid increase in money supply. 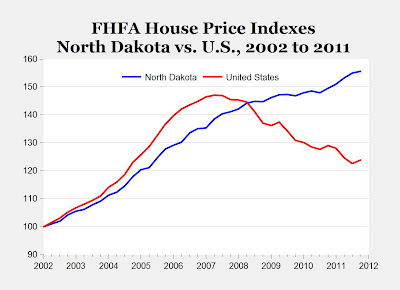 North Dakota's oil driven housing boom doesn't just consist of increased residential construction but also of soaring house prices. The Economist is now removing Argentina's consumer price inflation number from its list of economic indicators because it is so obviously false that the official numbers are of no use, comparable to past budget data from Greece. That seems like the right thing to do, though The Economist seems to have missed that the manipulation of inflation data has implications not just for the inflation numbers themselves, but also for real growth numbers. Since real growth is a function of nominal growth corrected by price inflation, an underestimation of price inflation implies an overestimation of real growth. Which brings us to Roger Bootle's telegraph column where he repeats the myth that because Argentina boomed after devaluation so would Greece. In my view, the greatest threat to the euro is that Greece will make a success of default and devaluation. Something like it has happened several times before, notably with Argentina in 2002, when it defaulted and devalued. The country went from an appalling financial crisis to growing by 11pc in the space of 18 months. Suppose that once the new drachma has fallen by 30pc to 50pc, Greece begins to show signs of growth. How would it then be possible to persuade the electorate of Spain, Portugal, Italy, and even Ireland, that there is no alternative to years of misery? Well, obviously, if Greece becomes a success after devaluation while Spain, Portugal, Italy and Ireland don't while remaining in the euro, then devaluation will look appealing. But there is no reason to believe that will happen. Britain's and Iceland's economies, for example, have remained weak years after their dramatic devaluations. Argentina is a misleading example because first of all, as pointed out above, its dramatic underestimation of inflation means that real growth has been far lower than the official numbers indicate. And secondly, to the extent the boom has been real it was as I pointed out in a previous post due to the fact that the prices of Argentina's export commodities coincidentally sky-rocketed in the years after its devaluation. Negative Real Interest Rates Doesn't Reflect "Pessimistic Outlook"
David Glasner claims that negative real interest rates in the U.S. reflects a "pessimistic outlook" among investors. But that's not true, except to the limited extent it reflects flight to dollar assets because of the European debt crisis, because if it had been true we would see stock and commodity prices falling. In reality, stocks and commodities are at or close to the highest levels since 2007. A theory more consistent with the facts is that it reflects an increase in money supply of about 10% the latest year. A higher money supply can be expected to push down bond yields while also raising stock and commodity prices, and that's exactly what we've seen. Jordan Weissman at The Atlantic denies that the Fed is responsible for the recent sharp increase in oil prices by asserting that the dollar has appreciated in value recently and is now stronger than before QE2 started. His argument is wrong on many levels. First of all, I don't think anyone has claimed that the Fed is the only factor behind the recent increase. Inflationary policies by other central banks and of course the Iran issue have certainly also contributed to this, and that is not just my view but the view of most people who argue that the Fed is at least partly responsible. Secondly, while it is true that the dollar has recovered from the lows of the summer of 2011, his contention that the dollar is stronger than before QE2 started is flat out wrong. In late August 2010, just before QE2 was announced, the dollar index was trading at around 83, while it closed at 78.4 this Friday, 5.5% lower. Weismann deliberately misleads his readers by ending his chart of the dollar index at the January peak of 82, despite the fact that his article was published yesterday, when the index was more than 4% lower. Thirdly, and more important, he ignores the point that the contention of Fed critics isn't necessarily that the dollar is weaker than in the past, but that it is weaker than it would have been without the Fed's actions. There have been other factors counteracting the effects of Fed actions, most importantly the European debt crisis that has greatly increased demand for dollar assets because they are seen (irrationally) as a safe haven. If not for the Fed, the dollar's rally between August 2011 and mid-January 2012 would have been even greater, and its declines before and after would have been much smaller or wouldn't have happened at all. In the end though, Weissman actually concedes that the exchange rate mechanism isn't the only way that the Fed can raise oil prices. However, he gets the story largely wrong. The other mechanism is simply that by increasing nominal demand, prices go up. And because oil and other commodities have perfect price flexibility, being traded at financial markets they will respond quicker than the more sticky prices that exist. Karl Smith wants to solve the problem with high oil prices by printing more money, just like most central banks did in the 1970s. Considering that printing money causes oil prices to rise, that's sort of like recommending a fat guy depressed about his obesity to eat more donuts and other fat foods. While California is rich in both conventional and renewable energy, gridlock in the state legislature has hampered development of these resources. Unlike North Dakota’s officials, who welcome the economic growth and new revenues, California lawmakers seem intent on reducing the state’s role in domestic oil production. Legislators have imposed laws much stricter than federal standards and worked aggressively to subsidize alternative energy sources and mandate their use. California’s Global Warming Solutions Act of 2006 and subsequent legislation—requiring that the state obtain at least one-third of its energy from renewable sources such as wind, solar, and geothermal—will impose onerous costs not only on businesses, but on every ratepayer and consumer in the state. Estimates vary, but at least one study projected that the law would cost the state economy $183 billion—a staggering burden for Californians already struggling under the highest energy prices in the nation. By contrast, North Dakota’s underdog story illustrates how a different approach to public policy—and in particular, to traditional energy procurement—can bolster economic activity and job creation. North Dakota’s energy boom has caused a host of “problems” every state wishes it had—such as the need for more infrastructure development and more housing to accommodate job growth. Some of the state’s rural communities have seen population double virtually overnight. In the same documents for 2007 and 2011 that I used for evaluatig the assertion that British exports had fared worse than Greek (false) and Portuguese (true) exports, we find numbers that refute the notion spread by Rebecca Wilder (among others) that the recovery in the Baltic states had nothing to do with booming exports. What we can see is that exports were 50% higher in 2007 than in 2011 in Estonia (€7.4 billion in 2007, €11.1 billion in 2011), 54% higher in Latvia (€5.6 billion in 2007, €8.6 billion in 2011) and 60% higher in Lithuania (€11.5 billion in 2007, €18.4 billion in 2011). Numbers that again were far weaker in Greece (-9%), Britain (+5%) and Portugal (+12%), as well as the EU average of a 11% increase. Despite a 25 per cent devaluation of sterling, UK exports to Asia in the last three years have grown at a slower rate than those from Greece and Spain. In 2011, per capita gross domestic product in Ireland was greater than that in the UK. Meanwhile, the role of the state in the UK economy has grown and taxes have risen. …More generally, individual risk and effort is not rewarded when the UK government share of GDP has risen from 38 per cent in 1999 to 51 per cent in 2011, the effective top rate of tax is over 50 per cent, and CPI inflation for the last five years has averaged 3.5 per cent. That part about Ireland is however misleading since a large part of Ireland's GDP is basically accounting fiction as multinational firms through misleading internal pricing attribute profits to Ireland to benefit from Ireland's low corporate income tax. As for his claim about British exports doing worse than that of Greece and Portugal he is right-and wrong. Between January-November of 2007 and 2011, British exports rose by 5% while Portuguese exports rose 12% but Greek exports fell by 9%. The rest of the facts are however correct. -During the housing bubble, "money was flowing easily", but that had of course nothing to do with the institution pursuing an easy money monetary policy. -The United States is a banana republic because its government isn't spending enough. -People who want to shrink the size of government are really motivated by racism, even though they won't admit it these days. -China is an enemy to America because it sells cheap goods to Americans. -Adolf Hitler, while creating a human catastrophe, was an economic hero who saved the world economy. Oil prices have recently risen, in part because of inflationary monetary policies and in part because the supply of oil from Iran is falling as the U.S. and the EU targets it with sanctions and as Iran has stopped deliveries to Europe even before the sanctions were formally implemented. That is of course going to put further pressure on European economies (except for Russia and Norway who benefits as exporters of oil), including the crisis hit ones in Southern Europe, while also illustrating the downside of a weak currency. A weak currency may raise nominal export earnings, but it will also make oil and other imports more expensive. Ramesh Ponnuru, senior editor of National Review, has an article criticizing Ron Paul for his economic theories, which is to say he is criticizing Austrian economics. I won't bother to refute all of his points especially since I've already refuted most of them when put forth by others, but I will mention his denial of the claim that the Fed's low interest policy have discouraged savings and encouraged borrowing. "Consider, for example, a world in which the Federal Reserve conducts monetary policy so that the price level rises steadily at 2 percent a year. Savers, knowing this, will demand a higher interest rate to compensate them for the lost value of their money. If the Fed generates more inflation than they expected, as it did in the 1970s, then savers will suffer and borrowers benefit. If it undershoots expectations, as it has over the last few years, the reverse will happen. The anti-saver redistribution Paul decries is thus not a consequence of monetary expansion per se, but a consequence of an unpredictedly large expansion. For the same reason, monetary expansion does not necessarily lead to less saving. There is no reason to believe that the real burden of home loans would be any larger in a world with 2 percent inflation than in one with 1 percent inflation." This would be true if price inflation was entirely caused by factors unrelated to monetary policy actions. If that had been the case we would indeed expect periods of time with unexpectedly high price inflation due to for example crop failures to be compensated by periods of time with unexpectedly low price inflation due to unusually good crops. But in reality, central banks create price inflation by lowering the real interest rate. They provide free money for the banks at levels below the natural level (time preferences of the population). This in turn enables the banks to lend more which in a fractional reserve banking system means a higher money supply which in turn creates price inflation. Lower real interest rates isn't just the result of higher price inflation, it is in fact the cause. But what about his argument that savers will demand a higher interest rate? Well, rational savers will indeed do so, but even assuming that all savers are rational (and that's an implausible assumption), it won't matter, because the banks won't need the savers as the central bank can create all the money needed for the banks to lend. All savers can do is either save in foreign currency accounts (which will lower the dollar's value), buy stocks or fixed assets (like real estate or gold) or not save and consume. Either way, savers behavior can't change the outcome when it comes to real interest rates, at least as long as the central bank is indifferent (or positive) to the inflaionary impact of their money printing. And it should be obvious that the Fed hasn't been significantly deterred from inflating by the effects on price inflation recently. This point also affect another of Ponnuru's assertions, that Fed monetary policy hasn't enabled government expansion. Lower real interest rates will encourage not just private individuals, families and companies to borrow more, but also government borrowing. And with federal debt at more than $15.4 trillion, or about 100% of GDP (comparable to Portugal) government borrowing enabled by low interest rates have clearly played a role in expanding the size of government. What the debt crisis is ultimately about is the fact that in certain Southern European countries people are spending too much compared to what they earn. With regard to this we are seeing significant progress in Portugal and Italy-but not in Greece. In Portugal, the current account deficit in December fell from €17.2 billion in 2010 to €11.0 billion in 2011. That is still above 6% of GDP and thus still far too high, but as it is more than a third less than in the previous year (and nearly 50% lower than in 2008) that certainly represents significant progress. The December change was particularly impressive with the deficit dropping from €2.1 billion to €750 million. Italy saw its December 2010 deficit of €4.9 billion turn into a €400 million surplus. Though some of that reflected a likely temporary increase in current transfer receipts, most of it reflected a genuine reduction in overspending. By contrast, there is almost no sign of progress in Greece, where the monthly current account deficit rose from €1.85 billion in December 2010 to €2.2 billion in December 2011. Perhaps some erratic one-time items distorted this number, but if you look at the figure for the year as a whole, it's only somewhat better, with the deficit only falling 8.3%, from €23 billion to €21.1 billion. With nominal GDP falling 6%, that's hardly any improvement at all. The Greeks may be spending less, but they're earning less as well, keeping the relative overspending intact, as all too many of them (but not everyone, to be fair) are too busy striking, rioting and torching buildings instead of trying to do something useful as the people of the Baltic states did and as too a lesser extent the Portugese and Italians are doing now. In March last year I discussed that the United States has an unusually large gap in rates of employment and unemployment based on the level of education. In most countries such data aren't available, but in two Asian countries where it is available, South Korea and Taiwan, there was virtually no difference at all, at least in unemployment. The U.S. gap remains very large, but it has actually dropped during the latest year. Between January 2011 and January 2012, the unemployment rate dropped by 1.2 percentage points for high school dropouts from 14.3% to 13.1%, 1 percentage point for people with only a high school diploma from 9.4% to 8.4%, 0.9 percentage points for people with "some college" from 8.1% to 7.2% while being unchanged at 4.2% for people with a bachelor's degree or more. The trends in the participation rate (which mostly reflects trends in "hidden" unemployment) reinforces these trends, so the difference in the changes for employment rates is even bigger. The employment rate for high school dropouts rose by 1.1 percentage points from 38.6% to 39.7%, for people with only a high school diploma it was unchanged at 54.6%, for people with "some college" it fell from 64.5% to 64.2% while the employment rate for people with a bachelor's degree or more fell from 73.2% to 72.4%. Given that the big gap was for reasons I explained in my original post mostly irrational, it is good that this convergence happens, at least to the extent that it reflects higher employment and lower unemployment among people with little education. While it is natural that people with a higher education should on average earn more, this should manifest itself in terms of higher wages or salaries for highly educated compared to persons with little education, not higher unemployment for people with little education. "I would go further and say most, if not all, resolutions of balance of payments crises involve devaluation. For Greece to pull this off without devaluation will require a brand new template." Except that the baltic states did in fact pull it off. In 2007, Estonia had a current account deficit of 18% of GDP (an even bigger deficit than Greece ever had) yet by 2009 they had turned it to a surplus. Latvia and Lithuania had deficits similar to Estonia's relative to GDP in 2006 and 2007, yet by 2009 they too had surpluses. And all of them did it without devaluations. The reason why they were able to do it so quickly is because unlike the deeply dysfunctional Greek society where all too many seems to think that strikes and vandalism is the path to prosperity, people in the Baltic states have focused on trying to produce more and to the extent they can't they simply stopped spending money they were unable to earn. China reduces its holdings of U.S. Treasuries. Good for them, since Treasuries have historically been the worst performing major security, and with yields currently well below the rate of inflation, there are good reasons to believe that they will be even worse investments in the future. This of course raises the question who the suckers that will lose money by buying Treasuries are. In the beginning of 2011, Estonia had the highest growth in Europe at 9.5%. This rate of yearly increase has now slowed down dramatically to 4% in the fourth quarter, with the quarterly change from the third quarter actually being negative. The reason for this weakening in growth is of course the fact that the overall European economy is weakening dramatically. More specifically it seems to be the slowdown in Sweden that is weakening Estonia's economy. In January (2011), exports to Sweden grew 128% to €162 million, but in November exports to Sweden actually declined from a year earlier, by 27% to €122 million. The numbers may seem small but remember first of all that we are first of all talking about monthly numbers so at annualized rates these numbers are 12 times bigger, and secondly that Estonia is a really small country with only slightly above 1.3 million people and a GDP of only about €15 billion, which can be compared with about €11.5 trillion for the United States and about €400 billion for Sweden. The difference in the size of the economies of Sweden and Estonia is roughly the same as the difference between the United States and Sweden. So, at annualized rate the gain exports to Sweden was €1.1 billion (12*(162-(162/2.28)) in January while the loss in exports in November was €500 million (12*(122-(122/0.73)). The swing from rising to falling exports to Sweden was thus €1.6 billion at an annualized rate, more than 10% of GDP for Estonia! To the extent the value added of these products reflected imported inputs, the loss in value added for Estonia was less than that, but even so it seems clear that both the initial boom and even more so the dramatic slowdown now in Estonia reflects largely if not entirely developments in exports to Sweden. Why did the change in exports to Sweden change so dramatically then? It seems that it reflected in part that the Swedish economy has slowed down dramatically too and in part that during late 2010 and early 2011 a few orders of a one time nature of electronics equipment were delivered to Sweden, deliveries that had a great impact on Estonia's economy because it is so small. We have often been told by Paul Krugman and others that deficit countries within the euro area, like Greece, Spain and Italy can't reduce their deficits without surplus countries like Germany and Holland reducing theirs. Yet in December 2011, the aggregate euro area trade balance swung to a surplus of €9.7 billion from a deficit of €1.7 billion in December 2010, as Greece, Spain and Italy saw lower deficits while Germany and Holland saw their surpluses maintained. This must mean that either 1) Something impossible has happened or 2) That Krugman was wrong. I leave it to you to decide which of these two things are more likely. In my previous post, I mentioned that one reason why unemployed may not be less competent than those that have a job is that they might be not as good applying for jobs as performing them. Here is a hilarious example of what you should definitely not say when being in a job interview and being asked where you see yourself in 5 years. It's not clear just how good Peter Griffin would have been at the unspecified job in question, but clearly he would have been better than he was in this interview (The reply he told himself not to say would probably not have been much better). You claim that the text books say that “higher minimum wages will increase unemployment if set above the marginal productivity of more workers.” I suggest the latter statement is meaningless (or it’s a circular argument) because minimum wages themselves (along with union wages and other factors) determine what level of remuneration corresponds to the marginal worker. I’ll explain. As unemployment falls, the marginal product of labour falls because it becomes increasingly difficult for employers to find suitable labour amongst the unemployed. And employers will continue hiring from the ranks of the unemployed till the marginal product equals the minimum wage / unions wage, etc. At which point employers tend to begin poaching labour from each other, rather than hire from the unemployed. Well, first of all, let's make it clear what "marginal productivity" is. Marginal productivity has nothing directly to do with the actual pay received by workers. Marginal productivity is the value added that a particular worker's work effort creates (or could create in cases where the worker is unemployed). To what extent this value goes to the worker or the employer is irrelevant for the issue of how big this value is. And as for the idea that marginal productivity of workers fall as unemployment falls, it seems plausible and could in some circumstances be right, but only under certain circumstances. First of all, employers must always hire the best persons, something that probably and hopefully is usually true, but definitely not always, either because employers have too little information, or because the job seekers is not as good at applying for jobs as performing jobs or because employers might have irrational hiring practices. And secondly, employers might not pick employees on the basis of their marginal productivity, they could pick them on the basis of how costly it is to hire them. A profit maximizing employer wants to maximize the difference between his workers marginal productivity and pay, but that can be maximized both by maximizing marginal productivity and minimizing pay. And thirdly, to the extent that falling unemployment reflects rising demand or lower supply for labor rather than lower pay, this means that the perceived marginal productivity of workers (again defined in the term of how much value added a worker's efforts creates) rises generally. Furthermore, the idea that hiring of the best unemployed during a period of falling unemployment means that marginal productivity falls is in a way true, but misleading because it confuses "generic marginal job seeker that can be hired" with individual workers. If the most productive unemployed gets hired it won't affect the (potential) marginal productivity of either any of those that gets hired and those that don't. It simply means that one shifts from more to relatively less productive workers. Why Excess Of Savings Over Investments? No, that what you would expect if you have a government budget deficit of over a trillion dollars that absorbs, or crowds out if you will, private savings as well as a lot of foreign savings. Jared Bernstein calls for an increase in the U.S. federal minimum wage. I should clarify that I think it is unlikely to lead to much job losses unless it's really dramatic. Remember that the current rate is only $7.25 per hour which can be compared with average hourly pay of $23.29 per hour and an average pay of $13.29 per hour in the lowest paid sector, "leisure and hospitality". So as long as it stays below $10 per hour it should only cause minor job losses-but it also means that very few workers would see their pay actually increased as a result of a minimum wage hike. "the textbook theory implies that a one penny increase in a market wage should lead to massive unemployment, and that, I can say with 100% confidence is not at all what we’ve seen." I'm not sure what textbooks he has read but I've read a lot and none of those I've read have claimed that a one cent [per hour, presumably] increase in minimum wages would cause "mass unemployment". What they've usually said, quite correctly, is instead that higher minimum wages will increase unemployment if set above the marginal productity of more workers. –profits: to the extent that the increase is paid for out of profits, we shouldn’t expect job losses. And in an economy where profits have dazzled while paychecks have fizzled, that ain’t a bad thing. Not correct. If it becomes less profitable to hire workers, fewer employers will want to do it. –prices: some studies find that a small bit gets passed through to higher prices. Well, it is indeed reasonable to expect that to the extent that minimum wages affects actual workers, it will cause prices to increase. But since higher prices reduces demand for the goods and services they produce, this means that there will be less need for workers, reducing employment. –reasonable rates: it matters what the level you raise it to, and historically, increases have affected less than 10% of the workforce, often even smaller shares. With relatively few in the “affected range” we wouldn’t expect to see large distortions. True, as I pointed out above, but as I also wrote above, this also means that fewer workers get their pay increased. –productivity: to the extent that higher wages reduce turnover and vacancies, a higher minimum can partially pay for itself by squeezing out such inefficiencies. It’s not wishful thinking—some studies have found just that. This point is actually partially true. If a job pays more then employees will be less inclined to quit, which in turn will reduce turnover of workers. But for most low wage businesses the cost of high turnover is relatively low since the tasks don't require much skills or training, and it is usually quite easy to find replacements. So while basically true, it is of only very limited relevance. –it’s stimulus! Minimum wage workers tend to spend the extra cash, so there’s more economic activity than otherwise would occur—btw, even under the redistributive scenario described under “profits” above, you’ll get this effect if low-wage workers consume more of their last dollar than those in the sky boxes. Well, while it might be true that minimum wage workers save a lower share of income increases than others. is really America's problem that its savings rate is too low? Given its trade deficit and relatively low investment rate, I'd say the opposite is true. Paul Krugman argues that the fact that crime, especially violent crime, has dropped dramatically in America even as marriage rates have dropped and out of wedlock births have increased, proves that "traditional values" isn't as important to a good society as conservatives asserts. But if we are to use such crude empiricism to refute conservative beliefs about the importance of marriage, then we can use it against leftist beliefs too. Because this drop in crime has also happened during a period when, as Krugman and others insist again and again including in this post, inequality has increased. This means that by Krugman's logic he is refuting the leftist belief that inequality and poverty causes crime. Now, I would say that the drop in crime is a result (mostly, there are probably other factors as well) of tougher sentences and better police methods and that it doesn't prove much about the effects of either marriage or inequality, except perhaps that their effects aren't that great, but the point is that if an aggregate change in crime is accepted as evidence of the effects of marriage then it can be accepted as evidence of the effects of inequality as well. Whereas, as I have mentioned in several posts, the mining (including oil extraction) sector is booming at an unprecedented rate in modern time in the world's biggest English speaking country, the United States, it is contracting very rapidly in the world's second biggest English speaking country, Britain. The latest industrial production data from Britain shows that it was 3.3% lower in December 2011 than in December 2010. However, if we look at manufacturing alone it was up by 0.5% compared to a year earlier. In part this reflected a 5.7% drop in electricity production reflecting the fact that December was warmer in 2011 than in 2010, but bhe main reason for this discrepancy is that the component called mining and quarrying sector saw a jaw dropping 15.5% decline in output. The drop in electricity production reflected a temporary fluke due to weather conditions (likely revered with the recent cold snap), but the drop in mining production seems to be more or less structural at least for the time being as mining production is as much as 31% lower than the 2008 average. Paul Krugman notes that only about 2% of America's GDP consists of goods exports to Europe and argues that even after increasing that number by 25% (to 2.5% of GDP) ta take service exports into account that means that there is little reason to expect a downturn in the European economy to affect the U.S. economy. But first of all, while no country or region specific data for service exports exists, total service exports is more like 40% of goods exports as goods exports was $126.6 billion while service exports was $51.3 billion. America's exports consists of services to a much higher extent than most other countries (with some exceptions like Britain and Hong Kong). Still, with a 2.8% of GDP estimate for total exports, even a 25% decline in exports would at most reduce GDP by only 0.7%, less to the extent that the value of exported goods consists of imported input goods. However, while America because of its size is less sensitive to developments in Europe, and other parts of the world, than most other countries, a severe recession in Europe would affect it beyong the direct effect on exports to Europe for two reasons. One is that because other countries in the world also export to Europe, their economies will weaken too, weakening U.S. exports to those countries as well. The second, and more important is the effect that globalized financial markets create. When there is panic in one market, other markets usually panic as well. Europe experienced that in 2008 after the Lehman meltdown. And if there is a similar meltdown now in Europe, America will experience it too. Another noteworthy news from the latest employment report is that the boom in mining (including oil extraction) employment continued. Whereas overall employment rose 1.5% and overall private sector employment rose 2% in the year to January, mining employment gained as much as 13.4%. While it even after that gain was only 0.6% of total employment, its increase was 4.6% of the total increase in employment. And that's only counting the direct employment in that sector. Add to that the jobs created by the demand from all those newly hired workers. The inflow of all those workers into the state who has benefited the most from the mining boom, North Dakota, has also created a construction boom in that state. Though not the only factor, the direct and indirect effects of this mining boom is therefore an important factor behind the recent uptick in U.S. growth. What are the causes of this turnaround? In part ir reflects the fact that growth is the natural state of the economy and that the factors that depressed it are dissipating and in part it reflects a credit-driven investment boom. Fixed business investments rose 7.5% in real terms in the year to the fourth quarter financed by a 11.4% gain in commercial & industrial loans. The fact that it is credit-driven indicates that it is an early stage of a classical Austrian business cycle scenario, but with the level of investments still below the peak levels of previous expansions, there is room for further expansion. One aspect that makes the upswing look sounder is that it has happened while government spending has declined. The category government purchases (spending excluding transfer- and interest payments) has dropped from a post-1992 peak of 21.1% of GDP in the third quarter of 2009 to 19.7% in the fourth quarter of 2011, mostly because of spending cuts at the state and local levels. "Basically, government has been shrinking for the past year — in practice, fiscal policy has been doing exactly what Republicans say it should be doing. Where’s my confidence fairy?" Today’s relatively elevated levels of UK inflation are not directly caused by money-printing, but by devaluation and the spike in energy prices. But since money-printing causes a currency to depreciate in value, this is sort of like saying that excessive consumption of fat foods doesn't cause heart disease, high cholestorol levels and other obesity related health problems, it's obesity that causes these thing. While a weak currency can be caused by other factors than money printing (for example the euro's drop the recent year reflects a loss of investor confidence) but then again obesity can also reflect too little exercise and/or genetics. Charles A.E. Goodhart, professor of Banking and Finance at the London School of Economics, argues here that credit ratings to be meaningful shouldn't just include the risk of formal default, but also the risk of default through inflation and the currency depreciation associated with it. This is an argument that I have made before,but it is nice to see that more people are getting it. Dean Baker criticizes the New York Times for reporting Germany's unemployment rate as 6.7% instead of 5.5%. The 5.5% rate refers to those who have no job at all, while the 6.7% rate also includes those who have only a part-time job but would want to have full-time employment instead. While there is a case for including those who have fewer hours than they want to, it becomes misleading to include them while making comparisons between countries because other countries only include those who are so to speak full time unemployed. I agree with Baker on this point, and could add that numerous other media outlets make the same mistake as New York Times. but he is actually wrong to assert that the German government reports the higher number as its official rate. Obviously, the German government reported it, as they are the source of both numbers, but the number specified in its official press release on employment and unemployment is in fact 5.5% and only (for the overall unemployment rate) 5.5%. The same goes for the Eurostat release on unemployment in the 27 EU countries including Germany. That makes it all the more puzzling why so many media outlets insist on using the higher number for Germany, and only Germany.